Sure, scoring a birdie while playing golf is no small feat. But dropping everything to save one's life is even more impressive. 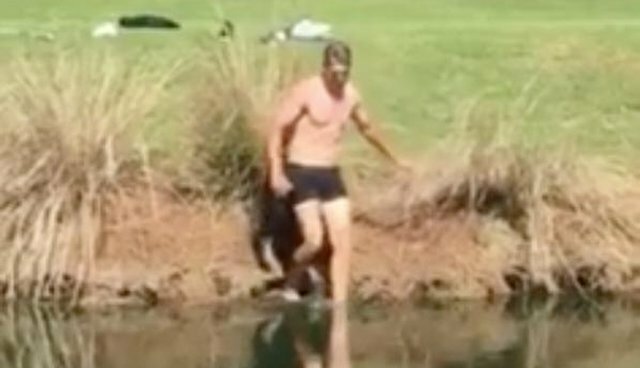 This pro golfer did just that - even though that meant stripping down to his underwear. While out on a practice round ahead of the Players Championship this week, Greg Owen spotted a baby blue jay in desperate need of a helping hand. The young bird had fallen from her nest, and as she attempted to fly back, she wound up plopping into one of the course's ponds where she struggled to stay afloat. Fortunately, Owen didn't hesitate to come to her rescue, wading into the water nearly naked in order to save the bird from drowning. You don't need to be a fan of golf to love everything about that.